We will be running on limited staff from February 28th until the beginning of April so that we can take a big journey to find more Asian artwork for you. Orders for items in our Beijing studio (including custom calligraphy scrolls) will be shipped normally. Anything located in our new USA art gallery, be a few days behind. Because the U.S. Government will not allow any of my staff in China to get visas, I was going to have my parents doing their best to ship orders from San Diego (my hometown) during this art-buying adventure. Luckily, right at the last minute, I found a nice guy from Beijing in San Diego that didn't mind taking a part-time job (more about him below). Below is a map that shows the planned journey for our first trip of 2006. Of course, plans often change drastically during these travels, so we'll see how much of this plan stays intact. In case you are wondering, yes, Taiwan and Tibet are considered to be provinces of the People's Republic of China. Before you protest, don't forget that the U.S. Government (and many others) confirm, and support this status/policy. This doctrine in regards to Taiwan is known as the "One China policy". This is Chen Shi (aka "James"). James is our newest partner in San Diego, but he's originally from Beijing. He'll be shipping orders twice-a-week from our San Diego, USA location. He's actually a struggling artist in San Diego who happens to be exhibiting his collection in the same building that our shipping room & art gallery is located. This trip will be rather ambitious. A lot of territory will be covered in a short amount of time. The trip starts as I return to Beijing from San Diego after opening our new art gallery over the last few months. My wife and baby daughter are in Beijing right now waiting for me. After checking up on how our portrait and scroll mounting workshop is doing in Beijing, the next stop will be the area near the border of North Korea. The goal is to seek out and make contact with some good Korean artists. Hopefully, you'll see Korean paintings and calligraphy available at Oriental Outpost if that venture is successful. The next stop will be Xinjiang Province. After a flight to Umürqi (the capital of Xinjiang) we'll hop on a train toward the border of Afghanistan. 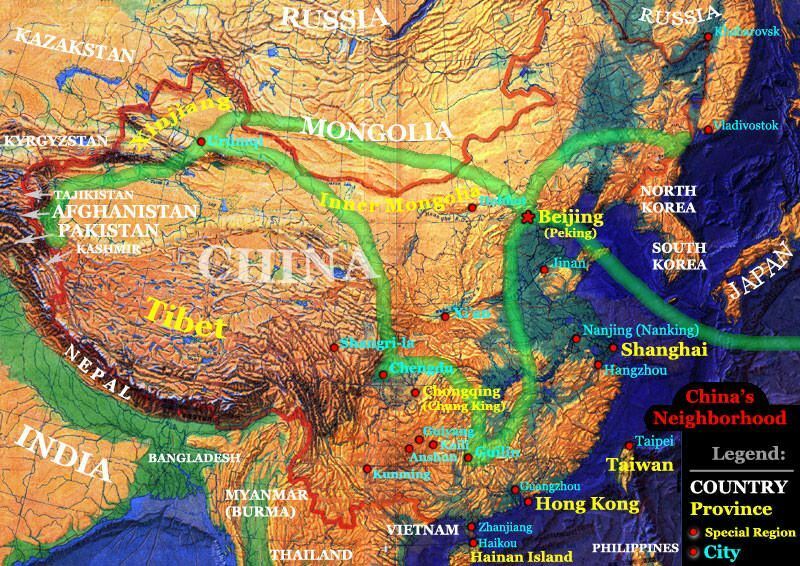 This region is populated by the descendants of Arab and Persian traders that once crossed China to buy and sell silk, spices, and other commodities. Over hundreds of years, their culture has merged with Chinese culture. They retain their Muslim heritage, though perhaps not as devout as their cousins in the Middle East. Some people describe this area as the wild west of China, where the law is the blade, and Afghanistan is considered to be the more civilized neighboring country. The goal of this stop will be to find a good Arabic calligrapher. It is only in this part of the world, that the kind of Arabic calligraphy that I am looking for is practiced. This style is a result of the combining of cultures that I mentioned above. Just imagine Arabic script written on a Chinese silk wall scroll. This will be my toughest assignment, but if all works out, you will see Arabic calligraphy wall scrolls by the end of April or first part of May on our website. My travel on this trip will be Ling Hua aka "Cat", my wife. small desert south of Inner-Mongolia 2003. If that part of this journey doesn't kill one of us, we will head southeast for a quick stop at our home in Beijing. Next will be a less-adventurous trip to Chengdu and Guilin. Two cities that have become very familiar to me over the years. There are plenty of artist-friends that live in those cities, and many more artists waiting to be discovered. If time permits, a stop in Jinan will allow us to meet with Qin Xia (one of our most famous and prolific bird and flower artists). When we return to Beijing, a lot of artwork will be mounted in our workshop, and packed into special suitcases for the flight back to the USA. The most traveled country in my life is China (also where I call home for about half of the last 4 years). 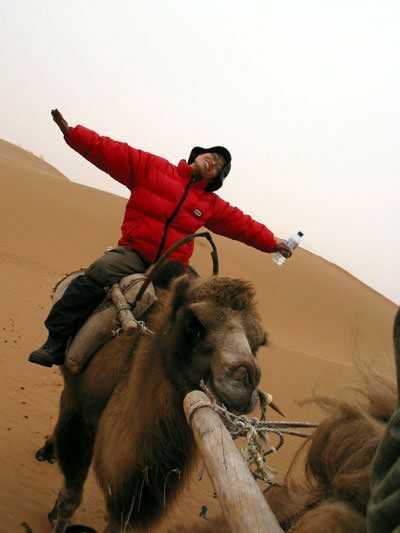 I've been seen with nothing more than a large backpack, starting from my home in Beijing to Inner Mongolia, the frontier of Tibet (Shangri-la), and probably a hundred cities, towns, villages, and tribal colonies throughout China.